These days, the emails are flying thick and fast between my friends and family as we attempt to straighten out our plans for Easter. So, Easter. We’re spending Friday with friends, Sunday is the traditional ham dinner with one side of the family, and on Saturday I will set a simple Spring-like table and host the other side of Danny’s extensive family for lunch. Or perhaps brunch, I haven’t decided. And Monday? Relaxing. 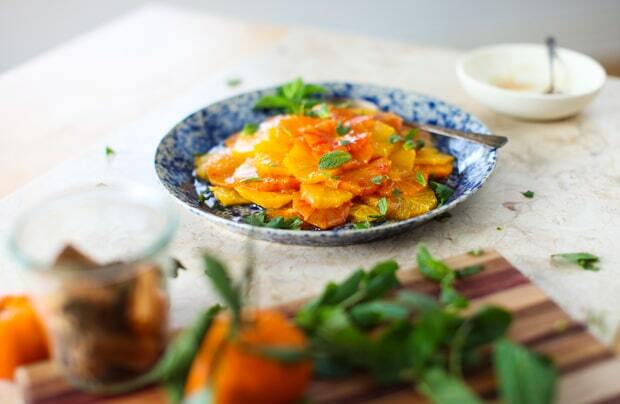 Here’s a peek at my menu plans and a quick citrus salad recipe that could swing for either brunch or lunch. First and foremost, there will be my raspberry-rhubarb Collins party punch, because with this much snow on the ground, we’re going to need gin. I’m thinking avocado deviled eggs and radishes with herb butter to start because they are both so darn delicious and simple, too. I’ll follow the appetizers up with an asparagus goat cheese galette, just-baked hot cross buns and today’s recipe for citrus salad with honey-cinnamon syrup. I’m keeping things vegetarian this year, because I know full well how much ham is going to be consumed over the course of the long weekend. Dessert is still undecided, although these Easter pavlovas with lemon whipped cream and rhubarb compote are hard to beat. Perhaps we won’t need dessert; this salad is a lovely way to end a meal. At the risk of complaining again, I’ll just say that this salad came to be because citrus is about the only decent fruit worth purchasing these days. 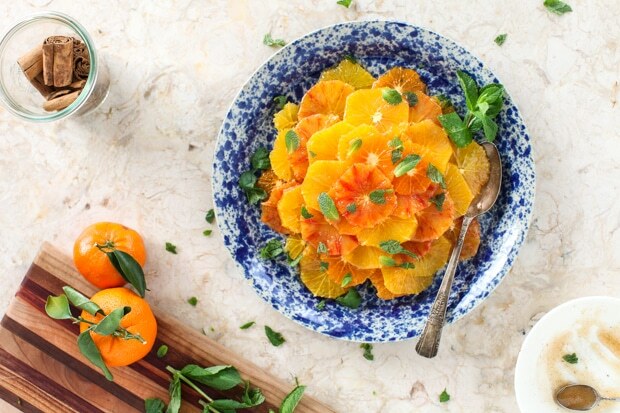 We’re eating preserved peaches and cherries from my pantry, and dipping into fruit compotes I have in the freezer, but when the cravings hit for fresh fruit, we’re gravitating toward clementines, blood oranges and grapefruit. It’s not bad at all, especially paired with honey, fresh ground cinnamon and a little mint. The last time we were in Mexico, Danny managed to hit up a tequilla bar with my brother, Josh, late one night. Between tastings, the bartender offered them orange slices sprinkled with cinnamon for a genius palate cleanser. I tucked that pairing away in my mental recipe archives to use as inspiration one day – and now here it is. I haven’t elaborated on the original much, because some things are best left simple. This pretty salad has only a handful of ingredients, but they come together well enough to make me forget my longings for summer fruits. Three varieties of orange, a drizzle of honey and a sprinkling of cinnamon tease the palate in a refreshing, tangy-sweet way. Try to use cinnamon with a bit of heat to it and be sure to garnish with mint only when you serve the salad. Trim the ends from the citrus, and working one at a time, cut off the peel from top to bottom. Slice the fruit into 1/4 inch rounds, removing any seeds you encounter. 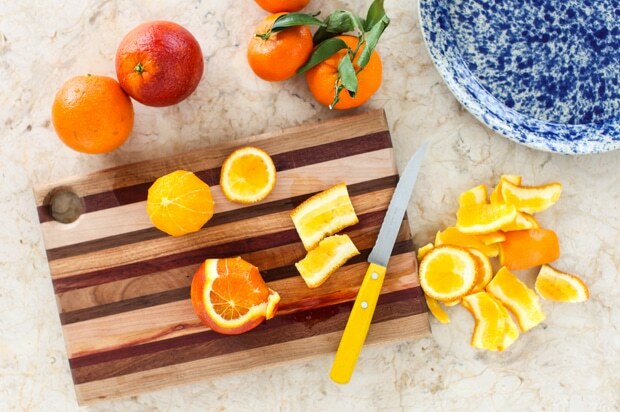 Arrange the citrus on a plate or platter with a slight edge to hold in the juice. Stir together honey and cinnamon. 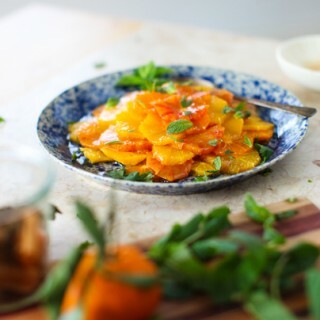 Drizzle the spiced honey all over the oranges. Garnish with torn mint and serve at once. You can make the salad up to 6 hours in advance. Hold off on the mint, keep the salad chilled, and garnish with mint just before serving. YUM! 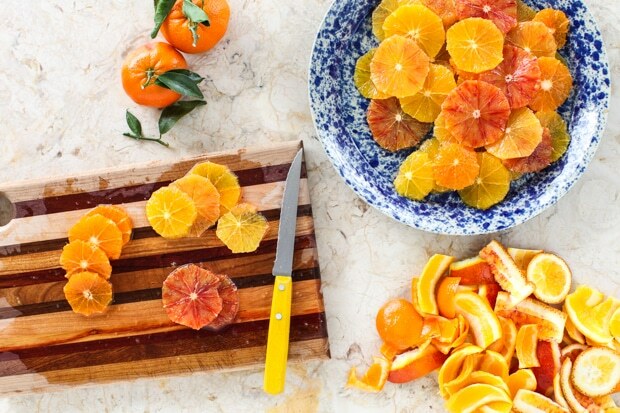 I love citrus- this sounds amazing! Thanks Jan, you too! And yes, we have to brighten things up somehow…. Hope you have a wonderful, refreshing Easter and that you start seeing some green before too long! Me too, Lisa. Thanks! Have a fantastic Easter yourself. I want to come to your place for dinner! All of the recipes that you linked look so fresh and delicious! I love this salad too – look at those colours! This salad is bursting with flavor! Let the refreshing begin! One of my favorites and I’ll be making it today for a Christmas gathering. It’s the freshest flavor in the dead of winter. Thanks for inspiring me!